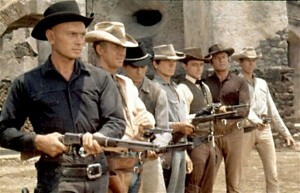 The Magnificent Seven is one of the definitive Westerns, with timeless themes, Oscar-nominated music, gun play (and knife play), and characters whose goodness or evil is never in doubt. Harry Luck (Brad Dexter) is one of the six gunmen that Chris Adams (Yul Brynner) recruits to help a small Mexican village raided periodically by marauding native bandits led by the evil Calvera (Eli Wallach). When Chris convinces Harry to ride with him, Harry is certain that there is much more in this for them than simply saving the villagers from Calvera’s oppression: some big payday, some treasure that Chris is keeping secret. Harry asks, “Gold? Cattle? Payroll?” Certain that there is more, Harry agrees to help Chris and the villagers. After some skirmishes with Calvera and his men, confronted with dim prospects and overwhelming numbers, Harry rides off. But in the final battle, Harry returns and saves Chris’s life. Harry lies fatally wounded after Calvera has been killed. HARRY. Chris… I hate to die a sucker. We didn’t come here just to keep an eye on a lot of corn and chili peppers, did we? There was something else all along, wasn’t there? CHRIS. Yes, Harry. You had it pegged right all along. HARRY. I knew it. What was it? CHRIS. Gold. Sacks of it. HARRY. Sounds… beautiful. How much? CHRIS. At least a hundred and fifty. HARRY. My cut would have been what? CHRIS. Maybe you won’t be. Was Harry damned? Did Harry die a sucker? An “earthly sucker” is one who lives to accumulate wealth, who seeks celebrity and fame, and who experiences all the pleasure possible here and now before death. The earthly sucker lives, and dies, chanting: “Eat, drink and be merry, for tomorrow you may die.” Based on this, Harry Luck did die a sucker. But was he also an eternal fool? “This is how it will be with whoever stores up things for themselves but is not rich toward God.” (Luke 12:15-21). One of the most interesting things about this parable of Jesus is that he says “But God said . . .” It is no person, no wife, no child, no centurion, no husband, no priest, no father, no official, no beggar that speaks – it is God Himself. And God tells this man he is an earthly sucker, a fool, because he sought material things and not things of true life.The earthly sucker may “gain the whole world” and in doing so “suffer the loss of his own soul.” (Matthew 12:6-26). “Let no man deceive himself. If any man among you seemeth to be wise in this world, let him become a fool, that he may be wise. For the wisdom of this world is foolishness with God.” (1 Corinthians 3:18-19). Choose selflessness and this present world will laugh at you, deride you, reject you, and ridicule you. It’s a hard choice, but it is your choice, every day – earthly sucker or eternal fool?